Wood-burning stoves aren’t known for being particularly efficient, and their smoke not only contains high carbon emissions but causes health risks to those who inhale it. A portable design from BioLite aims to tackle this problem and turn the stove into a cell phone charger in the process. 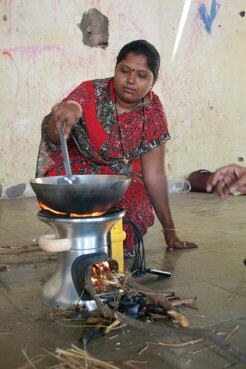 The stove converts heat energy into electricity, powering a small fan to improve the wood’s combustion. Beyond this, one to two watts are available to charge a cell phone or LED light via a USB port. The company sees two markets for their stove: Families in developing countries, and avid backpackers and campers. BioLite will release the CampStove version first, in spring of 2012. They hope profits from this product will help subsidize the cost of the HomeStove model for families in developing countries. BioLite claims to require half the amount of wood as an open fire and to cut smoke emissions by as much as 95%. Because billions of people depend on wood as cooking fuel, the stove has potential to improve health and, perhaps, slightly curb deforestation. The CampStove model weighs just under two pounds and boils a liter of water in less than four minutes. A variety of materials can be used to power it, including sticks, pine cones, dung, rice husks and underbrush. This could be convenient for campers tired of carrying cans of gas or petroleum to power their stoves. BioLite has already won awards for its designs, including the St. Andrews Prize for the Environment and first place in the 2010 Sustainable Brands Innovation Open.